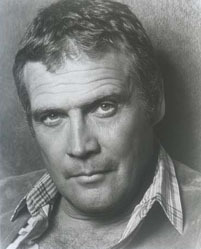 Lee Majors' father died before he was born, and his mother was killed in an auto wreck before his second birthdate. The toddler was then adopted by his paternal aunt and uncle, who brought him to their home in Middelsboro, Kentucky. Majors lettered in football for the high school team, which now plays its home games at Lee Majors Field. He also played college football, and was drafted by the St. Louis Cardinals (when that was a football team). He started acting as a hobby in 1962, and came to Los Angeles the following year. With his degree in Physical Education, he got a job working for the city parks department, where he oversaw North Hollywood Park and started buddying up with actors he met there. His new contacts helped open doors for auditions, and Majors became a working actor with a tiny but pivotal role in William Castle's schlocky thriller Straight-Jacket, playing Joan Crawford's husband. Majors had a more lasting career in television. In his first series, the 1960s western The Big Valley with Barbara Stanwyck, Majors played the half-brother Heath. He later joined the long-running The Virginian in its final season, playing a ranch hand with a mysterious past as the show was retitled The Men from Shiloh. He played the sidekick lawyer to Arthur Hill on Owen Marshall: Counselor at Law until he was offered the lead in The Six Million Dollar Man. When Majors left Owen Marshall, his character was replaced by a pre-Hutch David Soul. The Six Million Dollar Man ran from 1973 until 1978, usually in slow motion with bwa-wa-wa bwa-wa-wa sound effects. Majors played Steve Austin, the rebellious NASA test pilot whose body was mangled in a ghastly crash. But with the bio-technological advances of the 1970s, as the opening voiceover explained, "we can rebuild him... better than he was before. Better. Stronger. Faster." The series was based on Martin Caidin's well-written science fiction novel, Cyborg, and the first few episodes of The Six Million Dollar Man were faithful to the novel's stoicism, but soon the program devolved into camp, with Austin meeting Bigfoot, and the eventual addition of a bionic boy and bionic dog. Later Majors reprised his bionic Steve Austin role in several TV movies, most recently marrying Bionic Woman Lindsay Wagner in 1994's Bionic Ever After?. Majors began dating Farrah Fawcett years before she was famous for Charlie's Angels, and during the late 1970s they were perhaps the most famous couple in Hollywood. Beginning in 1978, Majors sought to reinvent himself as a movie star, and he was featured in some of the worst films of the era, including The Norseman with Cornel Wilde, Killer Fish with Karen Black, and Steel with Jennifer O'Neill. He returned to television playing the Gary Cooper role in the ill-conceived High Noon II. Majors starred in another action series, The Fall Guy, playing tough guy Colt Seavers, a stunt man who was also a bounty hunter. In later series, Majors took a supporting role as a tough veteran of three wars in Tour of Duty, and a wrinkly Majors returned to sidekick chores in the cheap, syndicated superninja drama Raven. Various sources give 1939, 1940, 1941, or 1942.